For sealing gaps between the tiles using a special grout or waterproof sealant. Qualitatively to make this work, you need to read tips from professionals. They will help to avoid mistakes. During laying of the tiles between the tiles leaving a gap. This distance was the same everywhere, use the details in the form of crosses. Fin thickness which is chosen based on the desired width of the gap. For example, for tiles of large size will fit TIC with a thickness of 4-5 mm. To finish the kitchen and the bathroom most often made with the seam of 2-2. 5 mm. They use to seal joints between tiles? For this purpose there are special grout. They come in the form of a dry powder that must be diluted with water, and ready. You can buy a mixture of colors that is most suitable for drawing the shade of the tile. If the desired color on sale there, you can take the white grout and buy the desired color. To get the desired shade, add a certain amount of dye and then mix it with dry powder. It will take a rubber spatula in small size. 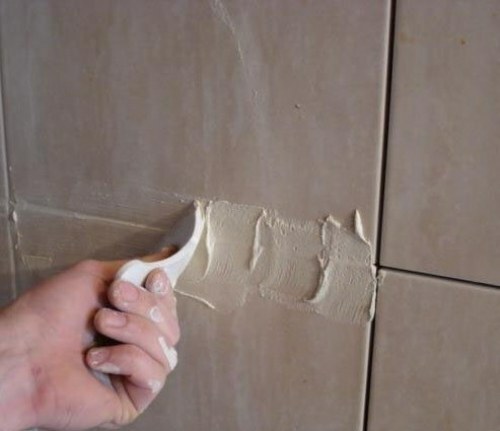 It is most convenient to apply the putty composition to completely fill the gaps between the tiles. Some masters at small amounts of cost that is applied to the grout with an iron spatula, and they also aligned it. In this line of work requires the utmost caution not to damage or scratch the top layer of tiles. How to seal the seams between the tiles? If the tile is pasted for a long time, you must first remove the one that is poorly kept and behind the wall. Then the reverse side of the tile, protect the metal with a spatula, moistened with water, is applied to the adhesive and attach the tile to its original place. If the seams between the tiles cracked over time and crumble, these places need to be cleaned out using a stiff brush or spatula, then moisturize. Then proceed to the application of grout. During operation, be aware that some spackling compounds tend to be drawn into the cracks as it dries. So sometimes you need to re-cover the seams. If the grout is prepared using colour, you need to take this into account and make the desired amount of the composition of one color, as when re-manufacture of mixtures there is a big risk not to guess the amount of colorant and the seams on the tile will turn out different in color. In some cases, to seal the gaps between the tiles using a waterproof silicone sealant. The need arises when working in areas of high humidity: saunas, pools, baths. Apply sealant just need to follow the recommendations of the manufacturer and try to hold it straight "nose" of the balloon relative to the seam. After the grout has dried, it remains removed with a damp cloth.